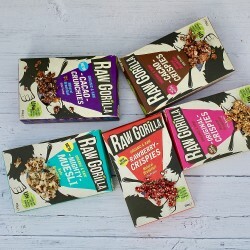 Raw Gorilla first began in founder Fraser's kitchen in London. 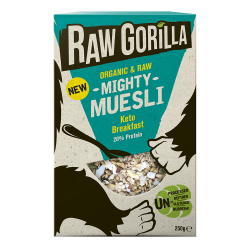 Fraser suffered from food sensitivities all his life, and was crazy about breakfast and raw food in general so decided to put his own twist on regular sugary and wheaty cereals and snacks to turn them into raw nutritional powerhouses. 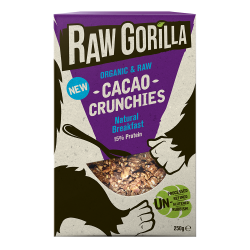 There is not a sniff of anything reﬁned or processed in Raw Gorilla's range, just raw organic ingredients which are full of activated wholesomeness and are vegan, gluten free and paleo. They believe that eating wholesome raw food helps us to feel healthier and happier and will energise us throughout the day. Gorillas are their inspiration, so they support The Gorilla Organization charity to help keep gorillas from extinction. 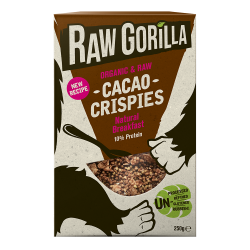 They take a really clean approach to food, with all their products being Vegan certified, Organic Soil Association Certified and free from gluten.